Thanksgiving is one of my favorite holidays by far! 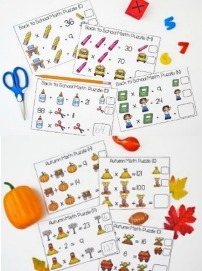 You can find several Thanksgiving activities for math and literacy (including free writing prompts) HERE in a previous post I wrote. In this post, I will share two of my favorite Thanksgiving read alouds and the activities I use with them. 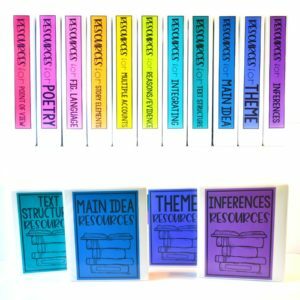 These read aloud and the accompanying activities are perfect for literacy centers. They are light-hearted, fun, and even my fifth graders enjoy the silliness. I love that I can sneak in some much-needed reading and writing practice with some tricky grade-level skills. 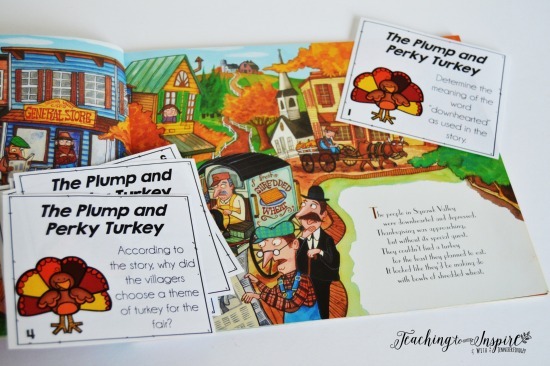 The Plump and Perky Turkey is a fun read aloud were a group of villagers are trying to persuade a turkey to join them for their turkey-themed fair. The main goal is to eat the turkey, of course. I particularly enjoy reading this book because of the rich vocabulary it exposes the students to. 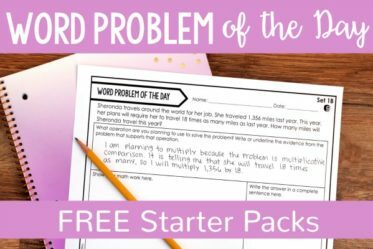 This is a great way to practice using context clues to define unknown words with a fun and light-hearted story. 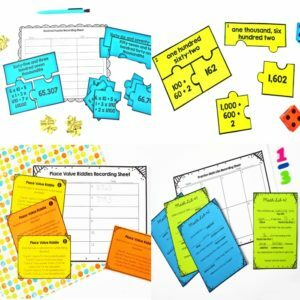 With this read aloud, I use a set of task cards with text-dependent questions. After reading the picture book aloud to the students, I simply place the book and the set of task cards in the center. 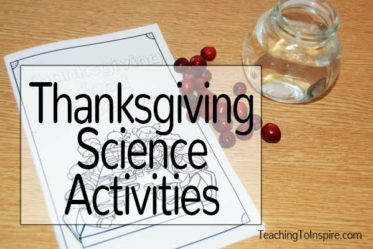 In addition to the task cards, this Thanksgiving read aloud lends itself really well to writing extension activities. I have my students write a new plan to persuade a turkey to join them for Thanksgiving dinner. I love the creativity I get from this writing activity. Another writing activity that is perfect for this book is to have the students rewrite the story from the point of view of Pete the Turkey. Point of view is a challenging skill but this read aloud makes it engaging and the students rise to the challenge because it is fun for them. 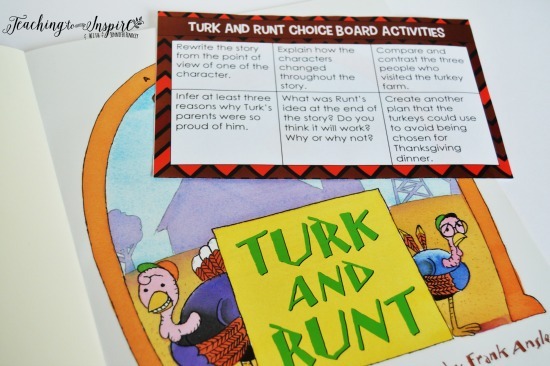 Turk and Runt is another light-hearted Thanksgiving read aloud about turkeys avoiding being eaten. 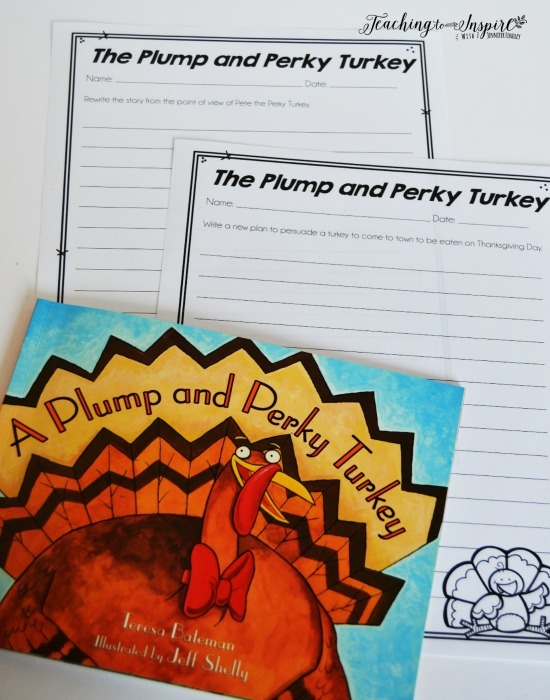 While this one does not have the vocabulary that The Plump and Perky Turkey has, the books pair perfectly with each other and are perfect for paired reading activities (more about that later in this post). In this read aloud, one of the turkeys (Runt) knows the real reason the people are visiting the turkey farm and selecting a turkey. However, no one will listen to him. Through a series of silly events, the other turkeys finally realize that Runt is telling the truth. But, will it be too late? For Turk and Runt, I created a choice board with questions. The students choose from the choice board which activities they want to complete (based on a number requirement that I give them). 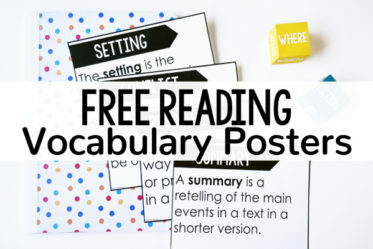 My students consistently use choice boards in reading that align with the standards (click HERE to read more about those), but I also enjoy using choice boards that are text-dependent with our read aloud books. And my students always enjoy having a choice in their work. Paired texts and paired passages are always tricky for my students at the beginning of the year. When I find engaging books that pair well together, I like to incorporate paired writing activities as much as possible. 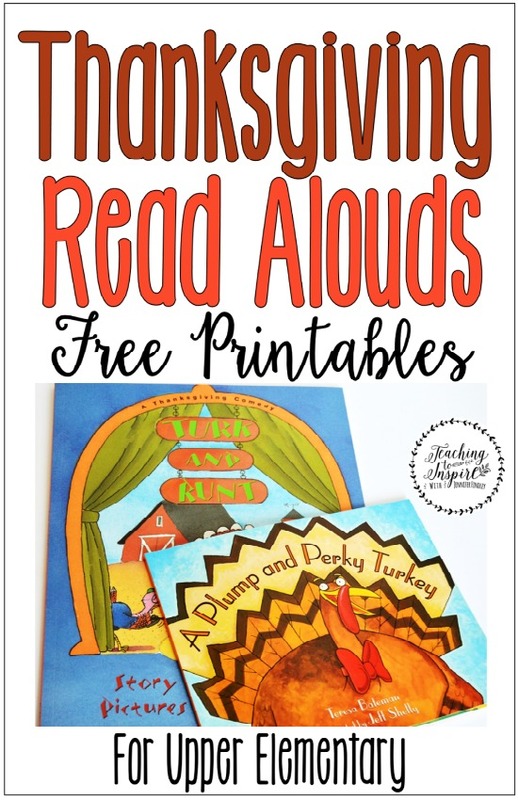 These two Thanksgiving read alouds are no exception as they pair perfectly together. I have two paired writing prompts that I typically let my students choose form. One prompt requires the students to persuade one of the turkeys to join them for dinner. 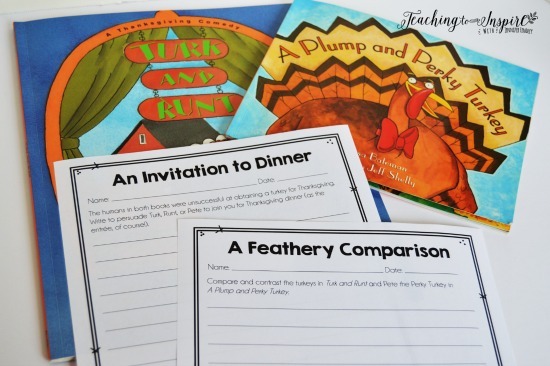 The other prompt has the students compare and contrast the turkeys in the two read alouds. 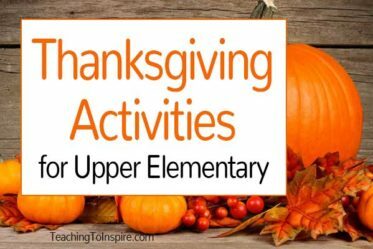 To grab more Thanksgiving activities for upper elementary, click here to see the resources I have available in my TpT store. To download the freebies show in this post, click HERE or on the image below. What are your favorite Thanksgiving read alouds? Let me know in the comments. I am always looking for new seasonal read alouds to add to my collection. You have really good ideas. 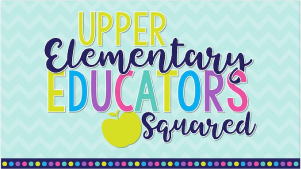 However, I teach second grade, love it, but do not see anything but info for the upper elementary. 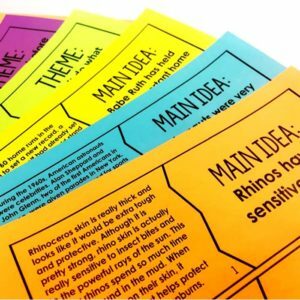 Do you have second grade ideas? Also, while checking out your ideas for holidays, there is nothing for Christmas. Don’t you have even a choice to learn about Christmas or some other religious celebration? WE have always celebrated Christmas in my classrooms for the past 20 years, and all the years of my schooling. I am offended that because some other beliefs have protested, that we who celebrate the month of December Christen events that it has been scratched . 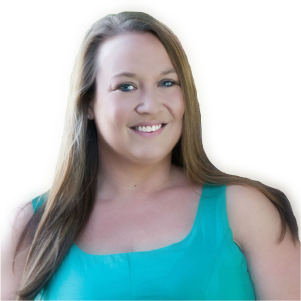 Hi Sharon, unfortunately my teaching experience is with grades 3-7, so I only post ideas for those grade levels. 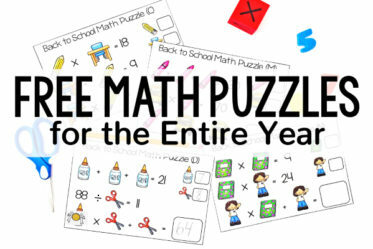 I would love to one day try 2nd grade and then I will have the experience to blog about it.